We are a Greek Orthodox Christian Church that serves our diverse cultural and ethnic parish community by providing opportunities and means to joyfully grow spiritually through communal celebration and experience as faithful Christians in the image of Jesus Christ. Assumption Greek Orthodox Church is a small but thriving church near the center of Madison, located at 11 N. 7th Street, on the corner facing East Washington Avenue. Today, our church is, in reality a multi-ethnic community which proudly includes many traditionally Eastern Orthodox peoples and their traditions. These groups may include Russians, Serbs, Ukranians, Armenians, Romanians, Croatians, and Arabs. It is a close-knit community that is growing as many people in the Madison discover its rich history and moving services and contributing ministries. We invite you to come see our Church. The beautiful tradition of the Divine Liturgy, the icons that make the building a priceless work of art, the soaring angelic voices of the choir, the warm and hospitable people, will all welcome you with open arms to a truly holy experience. The Divine Liturgy is the primary worship service of the Orthodox Church. The Divine Liturgy is a eucharistic service. It contains two parts: the Liturgy of the Catechumens, sometimes called the Liturgy of the Word, at which the Scriptures are proclaimed and expounded; and the Liturgy of the Faithful, sometimes called the Liturgy of the Eucharist, in which the gifts of bread and wine are offered and consecrated; the faithful then partake of them in the Sacrament of Holy Communion. The Church teaches that the gifts truly become the body and blood of Jesus Christ, but it has never dogmatized a particular formula for describing this transformation. The Prothesis (or Proskomedia), the service of preparing the holy gifts, can be considered a third part which precedes the Liturgy proper. The community of Assumption Greek Orhodox Church of Madison, was graced with God’s blessing, when a group of immigrants saw the need to establish a house of Orthodox worship in the city of Madison. 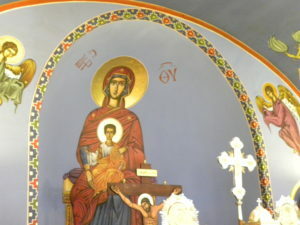 Assumption Greek Orthodox Church is a multi-cultural Christian Orthodox community that is part of the Diocese of Chicago of the Greek Orthodox Church in America. We invite you to come and worship with us in our beautiful church, to experience the Divine Liturgy in a beautiful, traditional setting, and to hear the singing of our renowned choir. After the service, come with us downstairs to our church hall to have some coffee, a bite to eat, and some good conversation. We are waiting to welcome you . Come visit us.